I purchased this sander over six months ago and am certain that it’s the best ROS that I have ever used. It’s much easier to handle than the older Porter Cable unit that I have borrowed from my father in the past and is light years ahead of the 5” Dewalt that I own in finish, stock removal, and dust collection. It can remove material fast with the heavier grits and leaves a fine finsh as you work up to 240 or 320. The cannister filter that came with it worked very well. With the optional 16 ft dust collection hooked up to my Rigid Shop Vacuum with the HEPA filter installed, it is practically dustless. whose husband is just getting into woodworking who will be glad to have it. Perhaps, I will review it once I have used it a bit more. My only complaint is that it requires six-hole hook and loop paper. Other than the Bosch brand, most papers, including the Mirka gold that I favor, have eight holes. The only reason I didn’t drop this to four stars is that the dust collection seems to work just as well with the eight-hole paper as it does with the six. This is the first Bosch tool that I have owned. 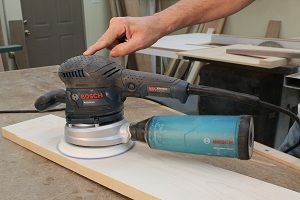 My experience with this sander will definitely cause me to consider them in the future. Nice. I have the 5” Bosch and it works like a charm. Bosch puts a good tool together. I esepecially love my 1617 router and could probably use a few more. The 24×4 belt sander actually works too well. I have several bosch tools. Maybe I should review them! I have found them all to be top quality for the price. My Dad has a 6” dewalt ros, and I have the 6” bosch equivelent. I by far prefer the bosch! Hooked up to my trend vac, no dust gets a chance to escape. Thanks for the review, good job. Nice review. I have the same sander and agree with your assessment. Great tool. Its top heavy, making it harder to control, kinda like flipping a fried egg with a golf club. what about variable speed or is peddle to the medal on the trigger ? It is variable speed, but like most sanders, the speed is controlled by a separate dial. I haven’t found it to be top heavy, but I use it mostly on pieces being laid flat on my workbench or assembly table. I prefer to do as much sanding as possible before final assembly. I would not want to use this sander on vertical surfaces all day long, but I have done it on occasion and did not find it to be burdensome. I believe this sander is manufactured in Switzerland. I agree with you, Tim, I didn’t find it difficult to control at all. In fact, for a good test use a single finger to control the sander as you sand a large surface. It is amazing how easy it is to maneuver even with one finger. On horizontal surfaces I can’t imagine a ROS that is easier to control. For vertical sanding, it is a bit on the bulky side but not too bad on smaller projects. I recently had a project that required a fair amount of vertical sanding so I swapped out the 6” pad and installed the 5”, and made it easier to manage. I have owned this sander about 2 years. There is minimal vibration. I use abranet sanding discs from mirka. The are phenomenal. Hooked up to a vacuum there is no dust! It’s light years ahead of any other ros I’ve used. I do agree it would not be ideal to use on a vertical surface. Otherwise, it’s flawless.